Background: Hemodynamic changes induced by labor pain and apprehension in addition to physiological changes may pose risk to parturients with rheumatic heart disease (RHD). Therefore, it is important to provide adequate pain relief during labor in these patients. We planned this study to compare the efficacy and safety of epidural (E) versus combined spinal - epidural (CSE) for labor analgesia in parturients with rheumatic valvular heart disease. Methods: Twenty-five parturients with RHD included in this study were randomized to one of the two groups - E group (n = 12), received 6 mL of 0.0625% bupivacaine with 25 μg fentanyl or CSE group (n = 13), received 25 μg of fentanyl with 1.25 mg bupivacaine diluted to 1 mL in subarachnoid space. Afterward, a continuous infusion of 0.1% bupivacaine with 2 μg/mL fentanyl was started at 6-8 mL/h. Primary outcome, analgesic efficacy, was assessed by visual analog scale (VAS) for pain. VAS ≤ 3 was considered as effective analgesia. Rescue analgesia in the form of epidural bolus was given if VAS > 3. Results: Demographic characteristics of the patients were comparable. Mitral stenosis was the predominant valvular lesion. The VAS at which the parturients received analgesia was comparable. The mean time to achieve effective analgesia was significantly faster in CSE group (4.46 ± 0.87 min) compared with group E (15.09 ± 5.7 min) (P < 0.001). Significantly lower median pain scores were recorded until the initial 15 min in CSE group. Afterward, median VAS for pain was comparable between the groups. VAS for pain was significantly low at all time intervals than baseline in both the groups. Maternal satisfaction and incidence of cesarean rate and complication were comparable between the groups. Conclusion: Both epidural and CSE are equally effective and safe for labor analgesia in parturients with rheumatic valvular heart disease. However, CSE technique provides a faster onset of analgesia. To the best of our knowledge, only few case reports are available in literature regarding the use of CSE , and epidural techniques ,, for labor analgesia in parturients with RHD. There is no comparative trial available for these two techniques in parturients with RHD. 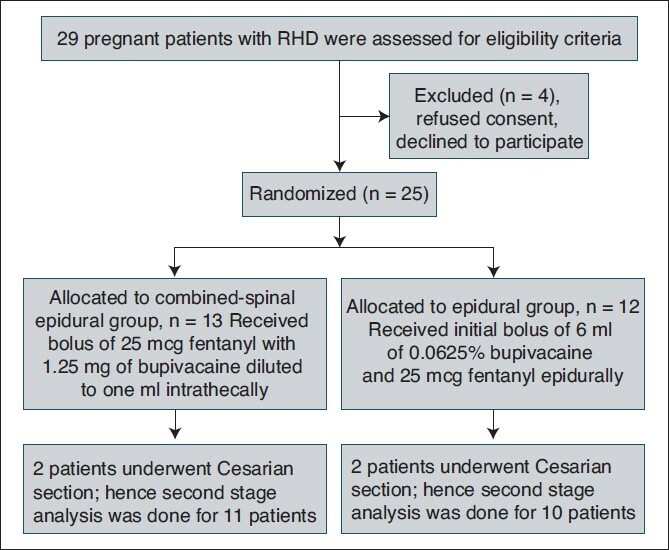 So this randomized, double-blind pilot study was planned to compare the efficacy and safety of CSE with epidural technique for providing labor analgesia in pregnant patients with RHD. We hypothesised that CSE technique may provide superior analgesia because of its rapid onset compared with epidural technique and may provide better maternal satisfaction. Following institutional ethics committee approval and written informed consent, 29 pregnant patients with cephalic, singleton pregnancy greater than 37 weeks gestation with RHD and NYHA class I and II, who requested labor analgesia, were assessed for study eligibility. The study was conducted at a teaching tertiary care hospital in northern India during August 2007 to October 2008. Patients with cephalopelvic disproportion, severe mitral stenosis (valve area < 1 cm 2 ), severe pulmonary arterial hypertension, bleeding diathesis, and any other contraindication to regional techniques were excluded from the study. Analgesia was administered to all patients in active labor (presence of at least three regular, painful uterine contractions over 10 min and cervical dilatation > 3 cm) according to the group allocated by randomization. A computer-generated random number was obtained (using block of three) and kept in opaque sealed envelopes. The envelope was opened by an independent anesthesiologist not involved in the study. 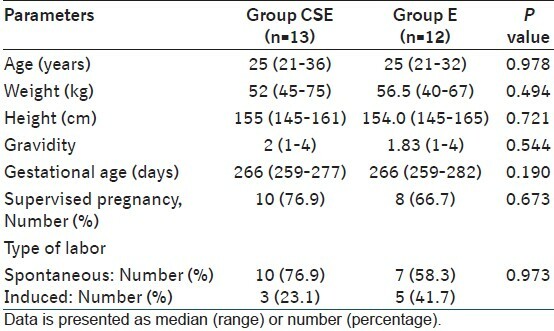 Patients were randomized to either the CSE technique (Group CSE, n = 13) or to the epidural technique (Group E, n = 12). Infective endocarditis prophylaxis was given to all patients before the procedure as our institutional policy. The patients were allowed oral fluids and liquid diet as per the institute obstetrician's protocol. In both the groups, intravenous access was secured and no preloading was done. ,, Patients were placed in the left lateral position. In group E, the lumbar epidural space (L 3 -L 4 or L 4 -L 5 ) was identified by using a loss of resistance technique with 18G Touhy needle. An epidural catheter was introduced and secured. In Group CSE (n=13), a 27G, Whitacre needle was inserted into subarachnoid space through the epidural Touhy needle using a needle through needle technique. A bolus of 25 mcg fentanyl with 1.25 mg of bupivacaine diluted to 1 mL was administered intrathecally. An epidural catheter was then introduced and secured. The investigator performing the procedure was not involved in further evaluation of the patient. One anesthesiologist (not involved in the study but involved in the clinical management of patient) administered initial bolus of 6 mL of 0.0625% bupivacaine with 25 mcg fentanyl in group E and sham bolus of normal saline in CSE group over 10 min after making the patient supine. In both the groups, 30 min from the initiation of procedure, a continuous infusion of 0.1% bupivacaine with 2 mcg/mL fentanyl was started at 6-8 mL/h. Severity of labor pain was assessed by a 10 cm long marked visual analog scale (VAS) with 0 representing no pain and 10 as worst pain. Motor power was assessed by modified Bromage score and sedation was assessed using a six-point Ramsay sedation score. VAS ≤ 3 was considered as effective analgesia. All parameters were monitored regularly and recorded every 5 min till 30 min then at 60 min and afterward every hourly till delivery. If VAS was > 3 between 15 and 30 min after starting the infusion, then 4 mL of 0.1% bupivacaine alone was administered through epidural catheter. If VAS was >3 between 30 min and 2 h of starting infusion, 15 mcg of fentanyl diluted to 4 mL with normal saline was given. If VAS was >3 after 2 h of starting infusion, 25 mcg fentanyl diluted to 4 mL with normal saline was administered. The primary outcome was the analgesic efficacy, defined as VAS ≤ 3. Secondary outcomes such as dermatome level of analgesia, heart rate, electrocardiography, blood pressure, pulse oximetry, pain score, motor power, sedation, and fetal heart rate. Duration of the first and second stage, mode of delivery, and the indication for cesarean section was recorded. Neonatal evaluation was done by Apgar score at 1 and 5 min and cord pH. Maternal satisfaction was recorded on a four-point scale, that is, excellent, good, fair, and bad. As an institutional protocol for parturients with heart disease, an assisted instrumental delivery using either the forceps or vacuum was planned in all patients. As there is no prospective, randomized controlled trial available in the literature for the comparison of these two techniques for labor analgesia in patients with RHD, this trial was planned as a pilot study. Data were expressed as mean ± SD or median (range). Nominal data between the two groups were compared using Fischer's exact test. Continuous data such as age, weight, height, period of gestation, duration of labor were analyzed using Mann - Whitney U test between the two groups. Hemodynamic data and repeated ordinal data (VAS for pain, sedation score, and modified Bromage score) were analyzed using two-way repeated measures analysis of variance. If it was found significant, Freidman test was used for within-group analysis and Mann - Whitney U test was used for between-group analyses. A value of P < 0.05 was considered significant. Twenty-nine patients were assessed for eligibility. Four patients refused consent to participate in the study. Hence, 25 patients were included in this study; 13 in the group CSE and 12 in the group E [Figure 1]. No technical difficulty was encountered in any patients. The demographic characteristics of the patients were comparable between the groups [Table 1]. All patients had mitral valve involvement, mitral stenosis being the predominant lesion. The severity of mitral stenosis (mild or moderate) and the NYHA status of the patients were comparable [Table 2]. In addition to stenotic involvement of mitral valve, 10 patients (six in group E and four in group CSE) had mild to moderate mitral regurgitation, four patients (three in CSE group and one in group E) had associated mitral and tricuspid regurgitation, one patient (group E) had associated aortic regurgitation and one patient (group CSE) had regurgitant lesion involving mitral, tricuspid, and aortic valves. Median VAS for pain before initiation of analgesia in CSE group and group E was 5 (range 4-7) and 5 (range 4-8), respectively. The VAS at which the parturients received analgesia was comparable [Table 3]. The mean time to achieve effective analgesia was significantly faster in CSE group (4.46 ± 0.87 minutes) compared with group E (15.09 ± 5.7 min) (P < 0.001). Significantly lower median VAS for pain were recorded at 5, 10, and 15 min in the CSE group compared with the group E (P < 0.001). After 15 min, the median VAS for pain was comparable between the groups. VAS for pain was significantly low at all time intervals than baseline in both the groups [Figure 2]. The median VAS for pain in the second stage of labor, that is, 2 (range 2-4) in CSE group and 3 (range 3-5) in group E was comparable (P = 0.124). A second-stage analysis was done only for 21 patients as four patients (two in the group E and two in the CSE group) had cesarean section before they reached second stage. Durations of first stage and second stage were comparable between the groups [Table 4]. No motor blockade was observed in any patient. Three patients in CSE group (23%) had mild pruritus compared with none in group E, which was self-limiting (P = 0.22). None of the patients in both the groups had any other complications such as sedation, hypotension, motor weakness, respiratory depression, and atonic postpartum hemorrhage. One patient in the CSE group had one episode of vomiting compared with none in group E.
One neonate in this study had Apgar score of 5 at 1 min and belonged to the CSE group. There was fetal asphyxia in this case because of cord entangled around the neck for which emergency cesarean section was done. 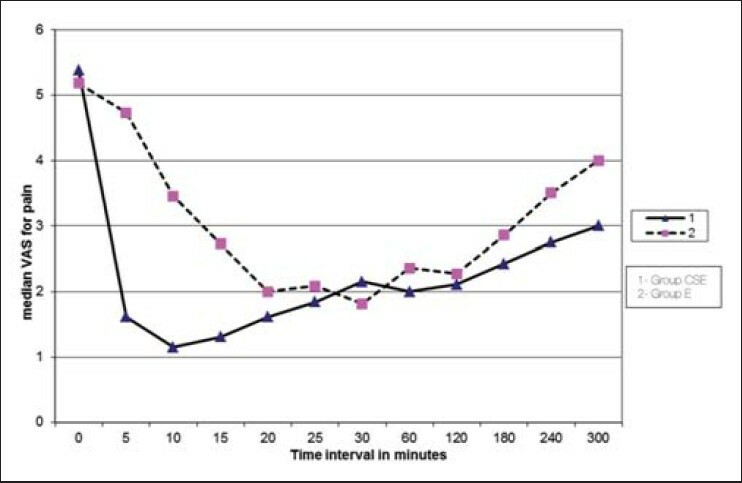 Resuscitation efforts with bag and mask followed by intubation and intermittent positive pressure ventilation improved the respiration in this neonate. The child was subsequently extubated and Apgar score at 5 min was 8. The umbilical cord pH in the neonate who had a low Apgar score at 1 min was 6.88. All other neonates had a cord pH of >7.2. One patient in the CSE group (7.7%) and three patients in group E (25%) required additional boluses of bupivacaine for pain relief. Out of these four patients, one patient in the CSE group and one patient in group E had first stage of labor lasting for 14 and 13 h, respectively. The patient who was allocated to CSE group underwent cesarean delivery because of nonprogress of labor. The maternal satisfaction following the administration of analgesia was evaluated following delivery. The maternal satisfaction was assessed using a 4-point scale and was found to be comparable. Eleven (84.6%) and two (15.4%) patients reported excellent and good analgesia in CSE group, respectively. Nine (75%) patients reported excellent and three (25%) reported good analgesia in group E (P = 0.694). This study is novel for the reason that it is the first randomized controlled study comparing CSE and epidural technique for labor analgesia in parturients with RHD. We found that both these techniques are effective in providing labor analgesia. The time to onset of effective analgesia was significantly faster in the CSE group as compared with group E. Maternal satisfaction was comparable despite faster onset of analgesia in CSE group. Incidence of side effect, mode of delivery, maternal and fetal outcomes were comparable in both the groups. Similar observation was made by other authors who also reported a significantly faster onset of analgesia with the CSE technique in comparison to the epidural technique. ,, On the contrary, Hepner et al found an early onset of analgesia (2.5 ± 2.2 min) in the epidural group also which could be attributed to the addition of sodium bicarbonate to the injectate. Regional analgesia by causing sensory blockade may decrease perineal sensation and obtund the urge to bear down and may increase the chance of instrumental delivery. However, in our institute an assisted instrumental delivery using either the forceps or vacuum is performed as an institutional protocol for patients with heart disease. This is done in an attempt to limit maternal Valsalva maneuvers and stress associated with expulsive effort. , Hence we could not study change in mode of delivery with these techniques. Fetal bradycardia has been reported after induction of labor analgesia with intrathecal opioids. Most studies suggest that incidence of this event is similar with either intrathecal or epidural labor analgesia. , We did not find any difference in the incidence of fetal bradycardia between the groups. We administered infective endocarditis prophylaxis to all patients in our study as our institutional protocol. This was because our institutional setting is a public funded tertiary care hospital in a developing country where all clean and unclean patients are kept in close proximity; hence the incidence of postdelivery infection in interventional delivery may be high. Another important consideration regarding neuroaxial blockades in women with valvular heart disease (especially with stenotic lesions) is the dramatic reduction in cardiac output secondary to preload reduction following sympathetic blockade. Systemic vascular resistance (SVR) may also get reduced due to arteriolar dilatation generating reflex tachycardia. Tachycardia is not well tolerated in stenotic lesions as well as in coronary artery disease. Reversal of the pressure gradient across a left-to-right intracardiac shunt may happen due to reduced VR, which leads to reduction in pulmonary blood flow catastrophically. However, such changes are less prominent with continuous centroneuraxial blockade as compared with single-shot spinal anesthesia. Neuroaxial blockade is beneficial with regard to its technical and pharmacologic improvements allowing it to be personalized according to the patient's requirements. It has also been observed that if neuroaxial techniques are applied carefully, these lead to minimal cardiovascular complications in cases of vaginal and cesarean section deliveries as well as labor analgesia in parturients with symptomatic heart disease. We also did not encounter any cardiovascular complication in our study in any group. The limitation of the study is that this is an exploratory pilot study of 25 parturients. However, this fact is justifiable as no prospective randomized controlled clinical trial is available in the literature for head-to-head comparison of these two techniques in parturients with RHD. Hence, sample size calculation was not needed. Further large clinical trials with adequate sample size are required to come to a firm conclusion. Significant early onset of analgesia in CSE technique may form selection criteria to choose this technique over epidural analgesia. To conclude, both the methods, that is, CSE and epidural analgesia are highly effective in providing pain relief during labor in patients with RHD. With the exception of a faster onset of effective analgesia, the CSE technique produced a similar clinical profile to epidural technique. Hence, effective labor analgesia could be provided by either CSE or an epidural technique but the administration of these techniques requires a skilled anesthetic, obstetric, and cardiology facility, vigilant monitoring, and prompt intervention. 1. Sawhney H, Aggarwal N, Suri V, Vasishta K, Sharma Y, Grover A. Maternal and perinatal outcome in rheumatic heart disease. Int J Gynaecol Obstet 2003;80:9-14. 2. Haththotuwa HR, Attygalle D, Jayatilleka AC, Karunaratna V, Thorne SA. Maternal mortality due to cardiac disease in Sri Lanka. Int J Gynaecol Obstet 2009;104:194-8. 3. Siu S, Colman JM. Cardiovascular problems and pregnancy: An approach to management. Cleve Clin J Med 2004;71:977-85. 4. Goldszmidt E, Macarthur A, Silversides C, Colman J, Sermer M, Siu S. Anesthetic management of a consecutive cohort of women with heart disease for labor and delivery Int J Obstet Anesth 2010;19:266-72. 5. Pan PH, D'Angelo R. Anesthetic and analgesic management of mitral stenosis during pregnancy. Reg Anesth Pain Med 2004;29:610-5. 6. Kuczkowski KM, van Zundert A. Anesthesia for pregnant women with valvular heart disease: The state-of-the-art. J Anesth 2007;21:252-7. 7. Desai DK, Adanlawo M, Naidoo DP, Moodley J. Mitral stenosis in pregnancy: A four-year experience at King Edward VIII Hospital, Durban, South Africa. Br J Obstet Gynaecol 2000;107:953-8. 8. Kuczkowski KM. Labor analgesia for the parturient with cardiac disease: What does an obstetrician need to know? Acta Obstet Gynecol Scand 2004;83:223-33. 9. Gambling D, Berkowitz J, Farrell TR, Pue A, Shay D. A randomized controlled comparison of epidural analgesia and combined spinal-epidural analgesia in a private practice setting: Pain scores during first and second stages of labor and at delivery. Anesth Analg 2013;116:636-43. 10. Miro M, Guasch E, Gilsanz F. Comparison of epidural analgesia with combined spinal-epidural analgesia for labor: A retrospective study of 6497 cases. Int J Obstet Anesth 2008;17:15-9. 12. Patel NP, Armstrong SL, Fernando R, Columb MO, Bray JK, Sodhi V, et al. Combined spinal epidural vs epidural labour analgesia: Does initial intrathecal analgesia reduce the subsequent minimum local analgesic concentration of epidural bupivacaine? Anaesthesia 2012;67:584-93. 13. Ngan Kee WD, Shen J, Chiu TO, Shaw KS. Combined spinal-epidural analgesia in the management of labouring parturients with mitral stenosis. Anaesth Intensive Care 1999;27:523-6. 14. Smedstad KG, Cramb R, Morison DH. Pulmonary hypertension and pregnancy: A series of eight cases. Can J Anaesth 1994;41:502-12. 15. Hemmings GT, Whalley DG, O'Connor PJ, Benjamin A, Dunn C. Invasive monitoring and anaesthetic management of a parturient with mitral stenosis. Can J Anaesth 1987;34:182-5. 16. Nielsen PE, Erickson JR, Abouleish EL, Perriat C, Sheppard C. Fetal heart rate changes after intrathecal sufentanil or epidural bupivacaine for labour analgesia: Incidence and clinical significance. Anesth Analg 1996;83:42-6. 17. Hepner DL, Gaiser RR, Cheek TG, Gutsche BB. Comparison of combined spinal-epidural and low dose epidural for labour analgesia. Can J Anesth 2000;47:232-6. 18. Palmer CM, Maciulla JE, Cork RC, Nogami WM, Gossler K, Alves D. The incidence of fetal heart rate changes after intrathecal fentanyl labour analgesia. Anesth Analg 1999;88:577-81. 19. Gomar C, Errando CL. Neuroaxial anaesthesia in obstetrical patients with cardiac disease. Curr Opin Anaesthesiol 2005;18:507-12.